You can help keep Ohio's waters clean. Do not flush medicines (prescription, over-the-counter, vitamins, patches) or personal care products (PCP's) down the drain or toilet. The Ohio Water Environment Association surveyed Ohio's water quality professionals to determine the "Top Ten Things Not to Flush". 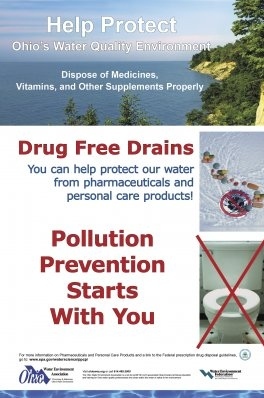 Please keep in mind that everything that is flushed or put down a drain has to be cleaned and removed before treated water can be released into Ohio's waters. As one water quality professional wrote "if you didn't eat or drink it, don't put it down the drain".